You know what they say; a week is a long time in politics but in Peterborough, twenty-four hours can seem like an eternity. 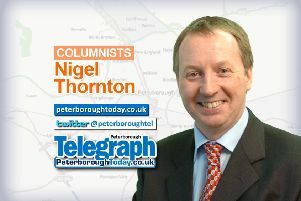 Almost as soon as the Tories had won back outright control of Peterborough city council, they had lost it again, when one of their number “forgot” which side he was on. To be fair to Councillor Gul Zawaz he does suffer from memory lapses; the last one cost him a spell at Her Majesty’s pleasure after he “forgot” that he had wrongly claimed £3000 worth of housing benefit. However, astonishingly, just hours after it was confirmed by senior party members that he had resigned from the group, he had pinned his blue rosette back on his lapel and rejoined the fold; that boy will be Mayor one day, you mark my words. But politics can be confusing; all those colours, all those claims and counter claims and all those bare faced lies. Take the referendum on Europe; we are almost a month away from voting but are any us any the wiser after weeks of campaigning from both sides of the debate? Stewart Jackson and his “Brexit” brigade stand down one end of Bridge street and claim Fruit Pastilles will be smaller if we stay in, whilst Nick Sandford is at the other end of the street with his supporters on the “Remain” train, warning of the second coming of the Spice Girls should we vote to leave. Boris Johnson evokes images of Adolf Hitler, as he compares the European union and their thirst for control, to the rise of the Nazis. All this whilst his Prime Minister, David Cameron, quotes Churchill and reels off some of the bloodiest battles from the past 500 years, in a warning that “isolationism” would not help avoid a repeat of the mistakes of the past. They line up the great and the good on both sides in an effort to woo, scare or batter us into submission but it only confuses the argument still more. It’s as if we cannot be trusted with the facts, trusted to make our own minds up from the information provided, so instead both sides rely on side shows and preposterous claims, in an effort to win our vote. Perhaps I am being too generous to our “confused” ruling elite. It is entirely possible of course that neither side has the foggiest idea what will happen should we vote out/in (delete as appropriate in the interests of balance) on June the 23rd. Is it possible that they are relying on ridiculous hyperbole because that is all they have; why else are indisputable facts in such short supply? Is all of this bluster just a cover for their own bewilderment? Maybe there are no crystal balls to gaze into, no definite answers as to what things will look like at the end of June if we wave auf weidersehen pet to Angela, au revoir to Francois and ta ta to Tusk. As a journalist I am not a fan of shots in the dark or leaps of faith; I need facts. In the absence of those I will have to rely on a tried and trusted method that has stood me in good stead down the years; my gut.